My last visit to St John saw us tucking into their roast suckling pig. It was all rather yummy, but I still maintain, as I did in that write up, that I cannot understand why this restaurant holds a place in the World’s 50 Best Restaurants list (currently 41st). St John also has a Michelin star, another fact which I find beggars belief. It might serve head to tail cooking, but its hardly refined or technical cooking. It’s good for a pleasant dinner out, but that’s about it. 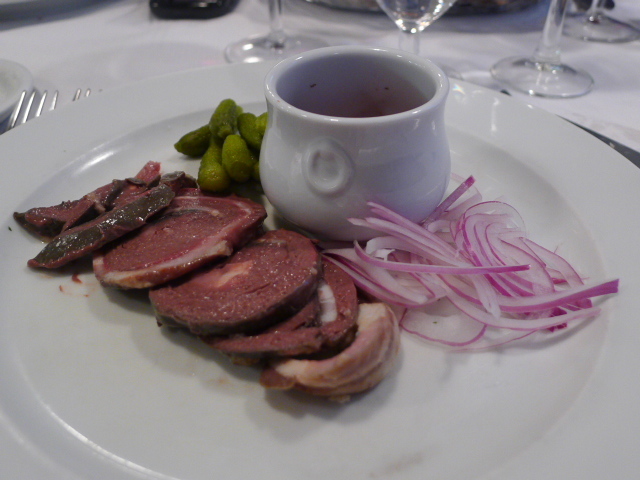 I was quite adventurous and went for the pig’s spleen (£7) which was served rolled with bacon. This was my first foray into spleen which was similar in taste to very strong liver. Not particularly enjoyable, its flavour was very powerful which necessitated lots of pickles. This was not a dish for the faint of heart. 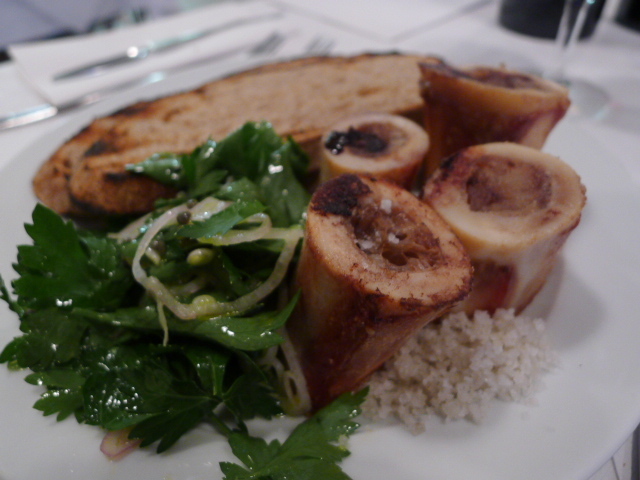 In contrast, the marrow in a dish of roast bone marrow and parsley salad (£7.10) was lovely and unctuous. It was served with some well buttered toast and the combination of the butter and marrow worked well together. 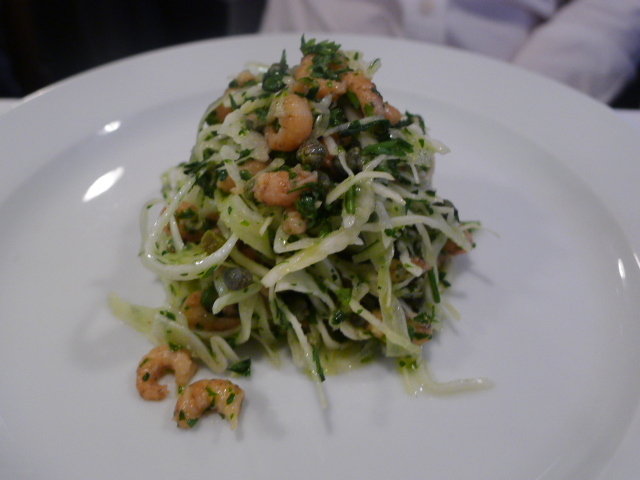 Also enjoyable was a starter of brown shrimp and white cabbage (£7.40). The shrimp was fresh and juicy, and there was a good crunchiness to the cabbage. 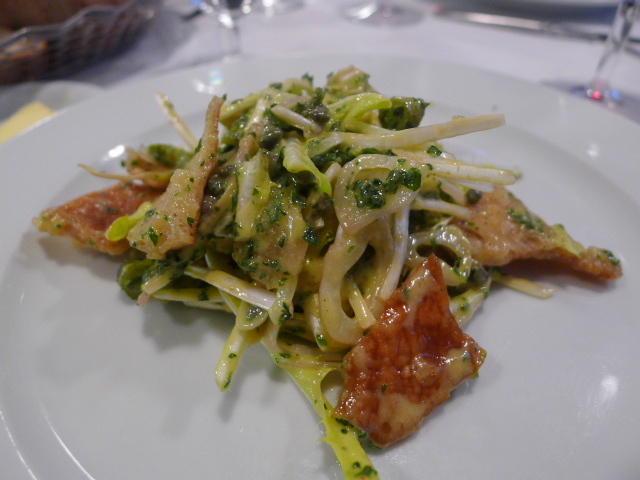 However, a badly prepared crispy pig’s skin and dandelion (£7.30) dish received a poor reception. The pig’s skin was very crunchy and the dandelion was resounding fresh, but the very heavy handed use of mustard in the dish made it unpleasant and difficult to eat. What on earth possessed to the chef to put this much mustard in the dish I will never know. 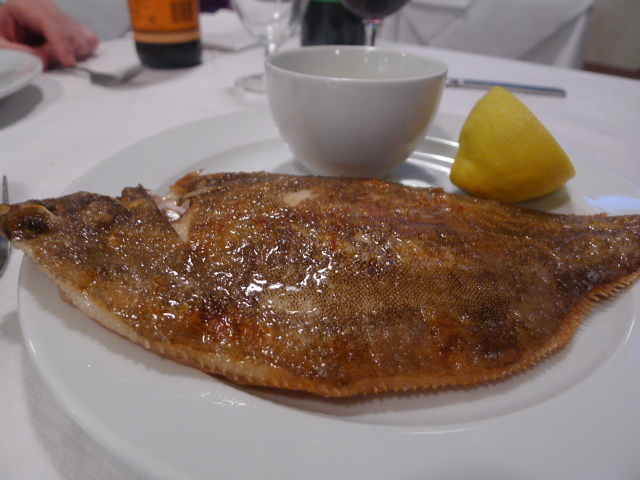 To the mains and a piece of fresh whole lemon sole served with tartare sauce (£18.70) was nicely cooked and moist. 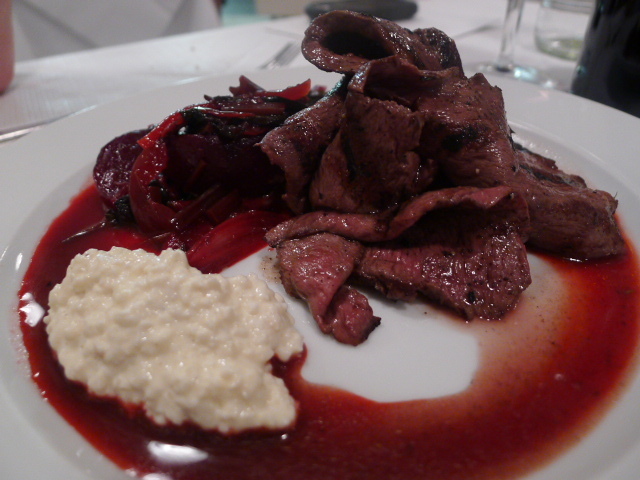 Grilled ox heart with beetroot and horseradish (£15.70) was robust and meaty. It had a lovely sweet flavour and the freshness of the horseradish was a nice match. 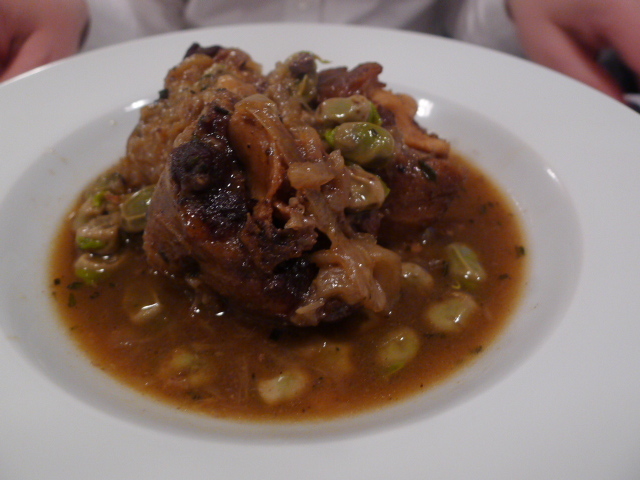 Less successful was the braised oxtail with broad beans (£16.30). The dish was pleasant, but unspectacular – there wasn’t quite enough richness or depth of flavour, and the broad beans had not been skinned. To skin or not to skin?? Roast lamb with see beet and mustard (£22.80) was hugely disappointing. 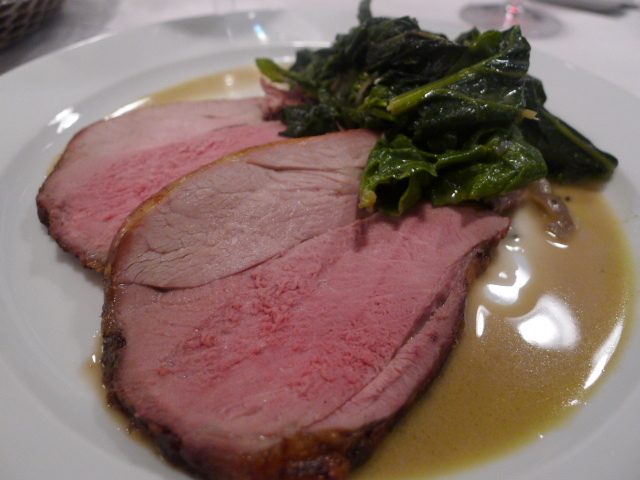 The plate produced two thin slices of bland lamb which had been pre-cooked and reheated. The beets had not been drained properly so were a little runny. There was also a slight bitterness to them. No better than pub grub, it was inconceivable that this dish cost £22.80 and was being served in a Michelin restaurant. Not only was there no technical skill involved, it was also expensive for a stingy portion. Desserts were far more enjoyable but not without its faults. 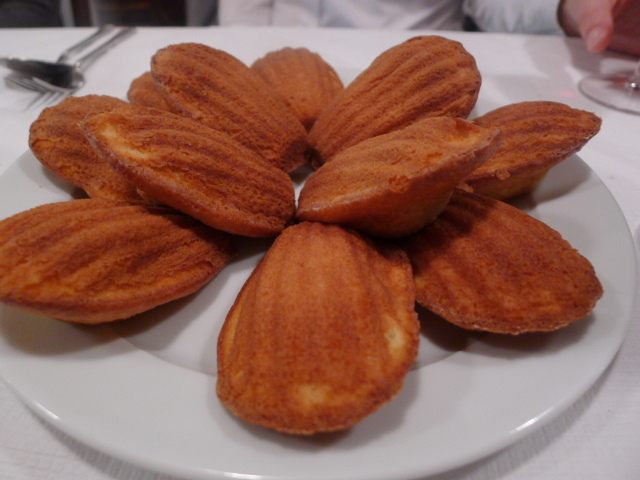 Madeleines (£6.90 for a dozen) were light and buttery but could have been crispier on the outside. 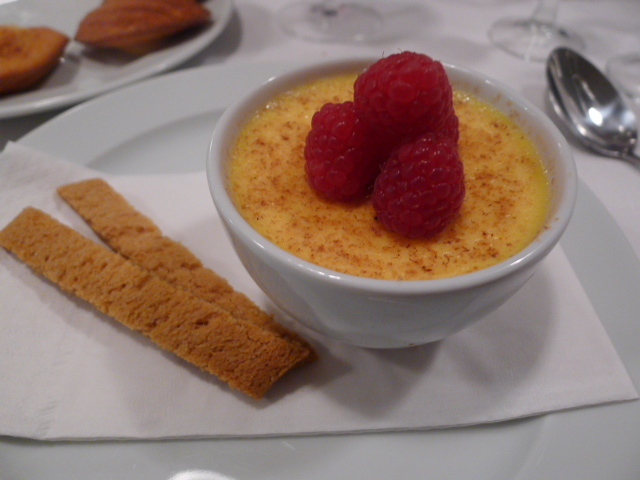 A baked egg custard with golden syrup biscuits (£7) was rather yummy and tasted just like a traditional custard tart, but it had not set properly and was a little runny. 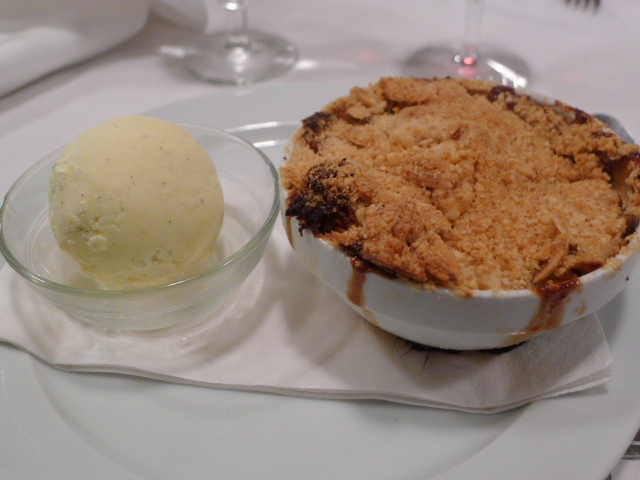 An apple crumble was scrumptious even if the topping was a little floury. 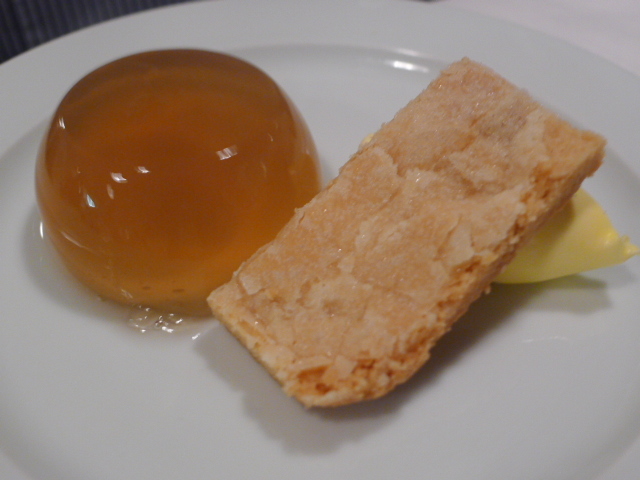 An elderflower jelly had a great wobble to it and a nice flavour. 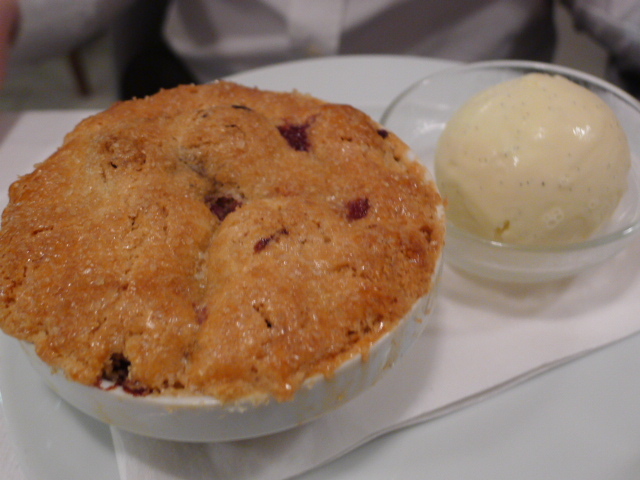 A cherry pie gave way to a wonderful crunchy topping. However, the cherries had not been stoned. It’s hardly graceful having to spit out pips in front of your friends at the dinner table or perhaps chipping your tooth on one because you were caught by surprise. The service was ok, but the waiter knocked over one of our glasses of champagne and failed to replace it. Rather poor I say. This was not a meal worthy of a Michelin star. There was nothing particularly technical about the cooking. What’s more, some of the dishes were very badly prepared, and shockingly so, given that St John has a star. From memory, the standard was not as good as during my last visit. There were some tasty dishes so it really wasn’t all bad. But honestly, what is with this restaurant and all its hype?!? The people at Michelin and The World’s 50 Best need to wake up and smell the coffee. As for you dear reader, just don’t go and expect anything special. Price range: £29 – £39 for three courses. Excludes drinks and service. Really surprising, not the food review, it’s totally in line with my experience, but the fact it has one star. I didn’t realise at all. You’d never guess from eating there. Wonder how long they’ll keep that for? I’ve been eating at St John’s for years now and I’ve never had a bad meal there. The food is very simply cooked and everytime I’ve been it has been cooked to perfection. Really interesting review. St John has never really appealed to me but that’s more to do the with the price – in my opinion nose to tail eating is about using all cuts to be economical so charging prices such as these for offal and similar is something I this is extortionate, however positive it is that a restaurant uses the lesser known cuts so often. I think that Michelin becomes more and more irrelevant as time goes on really. I don’t doubt the quality of what they use but slapping a couple of slices of cold roast lamb on a plate with some beets doesn’t really show technical genius or creativity. I made a similar lunch in my kitchen yesterday. That’s with no disrespect to St John – they do what they do and I am sure very well (the negative parts of this review aside), I just think that Michelin stars are ratings that don’t mean all that much anymore. Yeah, its hard to believe St John has a star. I had a couple of bad dishes. The rest were better. But you are right. The food is very simply cooked so its hard to believe that such basic cooking is star worthy. Many many thanks for your comments. I have to agree with you. When Michelin grants a restaurant such as St John a star it definitely undermines the value of the star system. And I also agree when you say that two cold slices of lamb doesn’t make for technical cooking So to the extent that Michelin does mean something to a lot of people, then all I can say is St John is definitely overrated.